We can’t all listen to everything. Who has the time? And particularly with film music, it’s sometimes difficult to discover that piece of music that might just be perfect to our tastes. Film score collecting is quite a niche hobby and sometimes great film music doesn’t get the exposure it deserves. There are many factors why we sometimes don’t come across this music. Often it can be due to the film they’re attached to. Maybe that film has had poor reviews, or we don’t like the genre. Perhaps we didn’t like a composer’s previous work. Whatever the reason, I’m sure we’re all missing some great music from our collections. The 1990s was a great decade for film music. Just mentioning names such as Batman Returns, Braveheart, Jurassic Park, Last of the Mohicans, The Lion King, The Matrix, The Piano, Star Wars Episode I, Terminator 2 and Titanic will stir great memories for many of us. However, this top 10 is designed to help you discover just a small fraction of ‘hidden gems’ from the 1990s. These scores aren’t necessarily the best from that decade – but they’re still great scores that have often been overlooked. They’ve been picked to help you find something that you might not have thought of tracking down before. 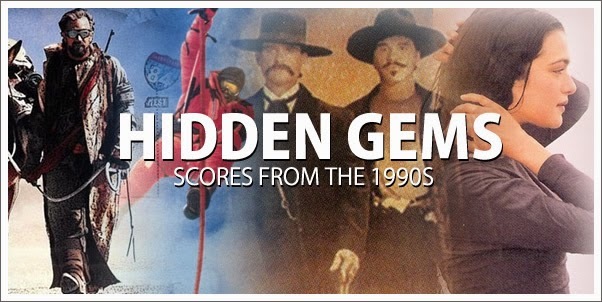 We’d love to hear your thoughts too – what ‘hidden gems’ from the 1990s have you discovered? Not to be confused with Chaz Jankel’s score for the same film, Hans Zimmer scored the European version of K2. Here Zimmer crafts a perfect mix of symphony and synthetics giving us a great range of emotions from muscular drums and wailing guitars to tragic strings. The 40+ minute album released by Varese Sarabande is presented in just 2 tracks – “The Ascent” and “The Descent”, but give this one your full attention, you won’t regret it. Based on the horror novel by Stephen King, the score for Needful Things is a true classic from Patrick Doyle. It’s full of melodic energy for choir and orchestra. The attention to detail in the choral performances and the complexity of the string writing is to be admired. You will believe the devil is coming! The 1993 adaptation of Mark Twain’s classic novel is another score full of orchestral melodies. This time Bill Conti provides us with spirited and uplifting music, cleverly weaving multiple themes together to give us a real sense of adventure. Just listen to the “Main Titles” track to see the joyous range of themes on offer here. Bruce Broughton brings the Wyatt Earp story to life with some really strong thematic material. The main theme in particular stands out for its dramatic use of strings, horns and powerful drums. There is also plenty of thunderous action music to get your teeth into as well as some more sombre moments. A true underrated classic. Murder in the First is a prison drama set on Alcatraz in the 1930s and 40s. Christopher Young’s score largely focuses on the emotional element of this. Here he cleverly interweaves three string themes to create a sense of both beauty and sadness. This feeling is peaked by the end of the album in the track “Redemption” when a choir is added and the strings soar to full effect. For this sequel to Escape From New York, John Carpenter reuses and updates his synthetic main theme to great effect. But it’s not until the latter half of the album when Shirley Walker combines some pulsating action music for both synths and orchestra that this score really starts to shine. Tracks such as “Hang Glider Attack” and “Fire Fight” are outstanding. Swept From the Sea was one of John Barry’s last film scores and it is one of romantic beauty and longing. In typical Barry fashion, the music becomes darker with each passing cue, but the beauty is never lost and there is always a sense of hope. A masterwork that belongs in any soundtrack collection. Kevin Costner’s The Postman was universally panned by critics upon release, but there are pleasures to be had. One of them is James Newton Howard’s melodic and energetic score. It’s full of heroism and dramatic rhythms, the best of which can be heard in the cue “The Restored United States”. I just wish that the sound mix on the Warner Brothers album was louder! The main attraction of Ryuichi Sakamoto’s suspense score for Brian De Palma’s Snake Eyes is the wonderfully emotional theme for strings and solo horn. Highlights include a brilliantly re-orchestrated 7 minute suite at the end of the album and the dramatic bombastic track “The Storm” – a fitting nod to the great Bernard Herrmann. Don’t be put off by the mediocre thriller that this score is attached to, because Craig Armstrong is on true form here. The main theme is both edgy and emotional as Armstrong uses piano, synths and strings to portray the crime ridden New York Streets. This theme comes to a dramatic and rhythmic conclusion in one of the album highlights, “Pier Pressure”. The music never becomes dull and the album is a great listen from start to finish. Did we miss any hidden gems from the 1990s? If so, let us know in the comments!